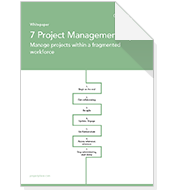 How to manage projects within a fragmented workforce. Is it any wonder that pressure in the modern work place has become a health issue in some markets? Just look at what you’re facing today: results-oriented projects with tight deadlines, 24/7 working mentality and tight budgets. There’s no surprise that managers and teams are under a lot of stress. With more and more wide-scale projects involving multiple teams across many countries and time-zones, cloud-hosted project management tools are becoming essential to effectively assign tasks and resources.